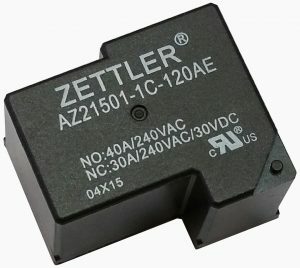 American Zettler Power Relays – Component Solutions for Pool Pump and Spa Control Applications | American Zettler, Inc. Relays are at the core of control boards for the pool pump and spa industry. Not only do they switch the pump itself, but also heaters, chlorinators, lights, and audio/visual equipment. It is therefore no surprise that American Zettler’s wide range of power relays is highly relevant for these kinds of applications. One of the top players in the pool pump and flow control industry recently needed a fast and reliable replacement for a competitive relay that was being obsoleted. They were looking for a high level of product reliability and competitive pricing. American Zettler’s miniature power relay was the perfect answer for this replacement project and was quickly chosen as the winning design. The relay comes in 3 contact forms, features a 50 A switching capability and very low cost per switched power. For similar applications or to learn more about the wide variety of American Zettler relay solutions in Power, Lighting, Appliance, Automotive, Industrial, Solar Inverter and other applications, please contact the us.